Doberman Forum : Doberman Breed Dog Forums > Doberman Talk Regional Forums > US Regions > Southcentral US Region > Doberman Talk members in LOUISIANA?? Doberman Talk members in LOUISIANA?? Any Doberman owners in LA? We live in Acadiana and were wondering if there were any DT members near by? Just joined today. I'm thinking about getting a pup sometime at the end of the year or beginning of next year. Any suggestions on where to get one? Hi we are from Church Point not far down the road! Any suggestions on where to get [a pup]? Best wishes for a successful DoberSearch. I'm originally from just south of Alexandria, LA, but now I'm in Jackson, MS. I'm glad to see other doberpeople from the DEEP south!! haha. We're fostering a dog for the Gulf Coast Doberman Rescue, Colt (he's at the bottom of the "Doberfriends" page) - Gulf Coast Doberman Rescue. They also have a facebook page. They do all kinds of events around New Orleans. Even if they don't have a puppy that you want right now, if you put in an application, they will contact you when they have pups. We found a breeder in Ville Platte (where my wife is from). Any suggestions on a vet that can do a good crop? I've heard really good reviews for Dr. Fruge in Eunice, but I'm not familiar with how often you have to follow-up (I know that the follow-up will determine the results) and we live in Shreveport. I would recommend buying from a breeder who handles the cropping before the puppy goes to their new home. Agreed, no offense to you or your breeder, but make sure you have found not just a breeder but a good, reputable breeder! In the long run, you'll be glad you did! Check out the puppy-buying guide here at the DCPA: Buying A Doberman Pinscher and also feel free to post in the "Breeding & Breeders" section to get other member's experiences and feedback with your breeder, or others in the area. Any of you Louisiana dobe-folk happen to be near the Leesville - DeRidder area? Hi Nick! We're in Duson! Right down the road from you guys! I wish there were more Dobe owners from our area on here! I would LOVE to get Duke together with some other Dobe's! We're down the road in Baton Rouge. Have an AKC 12 yr old spayed black/rust female with Brykris championship lineage. The other side is Elhaus. At 9 mo, we got this sweet, beautiful show ring dropout basically for the cost of her ear & tail docking. Our first Dobe, and 11 yrs later, couldn't be any more pleased. European-style blunt muzzle, wide head, nearly perfect lush satin velvet coat (after some initial Demodex issues), super-obedient, smart, funny, and sweet. And, healthy. None of the serious maladies common to Dobes. Originally got her as indoor security companion for widowed MIL, but didn't work out, so we took her. Never looked back, and it's been great. But...she's now 12 and slowed way down. We'd love another one similar to her, if possible. Buy or adopt. We'd prefer a young adult, or an older puppy. Another show ring dropout would be ideal. Dogs Age: Will be 2 on January 22, 2013! I see this was posted in 2010, but I must say that I am in Lafayette Louisiana. I would love to go to Youth Park (off leash dog park) or Gerard Park (On leash dog park) to meet up with other Doberman owners and their Dobies as well! If you're in the area please message me and let me know!! Hi there! We are here in Lafayette with a 3 yr old dobe! We are also looking for other owners. Hi from SHREVEPORT! Meet Brutus! 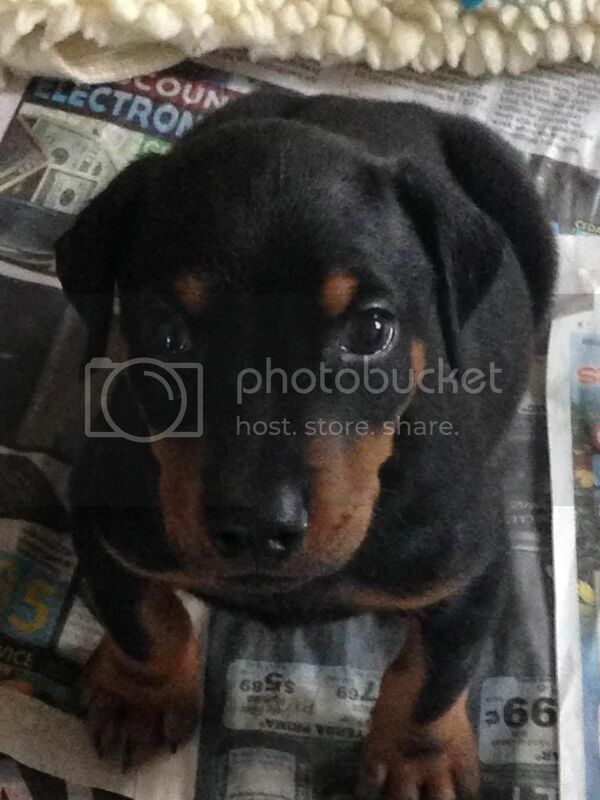 He turns 7 weeks on Monday, and we get to pick him up from our breeder (Rhapsody) in Austin around Dec. 21st! Also in Shreveport. Our boy Otto is 14 weeks old. Welcome from Wyoming! My sister in law is from Arcadia. We just got our boy Drago two weeks ago! Drove all the way to Kansas City MO!! Last edited by Ashley1088; 04-22-2014 at 02:55 PM. In the Lake Charles area.